Our Co-Founder, Chad Hayduk, traveled to "The City of Lights" recently and was inspired by the most fantastical scene - the midnight reflection of the sparkling Eiffel Tower onto the Seine River. Mesmerizing deep green, enlivened by a kaleidoscope of gold and silver shimmer. It is created in an incomparable wet/dry formula which is finely milled imparting a silky texture and a smooth satinée finish. This versatile powder can be used as both a shadow and a liner-offering the best of both worlds. 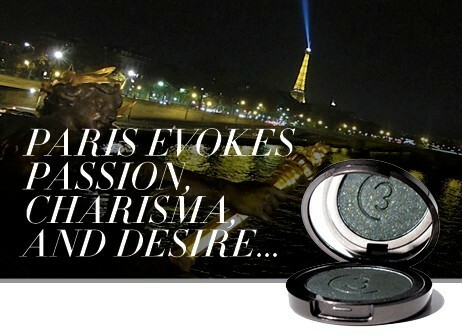 Whether you've visited Paris or traveled there in your dreams, this eye shadow is the perfect way to relive the magic of Paris daily. A mesmerizing deep-green enlivened by a kaleidoscope of gold and silver shimmer. In compact with mirror as shown. A mesmerizing deep-green enlivened by a kaleidoscope of gold and silver shimmer. Refill for use with Trio.